When the Panthers did not make a move for a wide out early in the 2013 NFL Draft, it sent shock waves through not only the fan base, but through football writers whom were deemed clueless after not selecting a wideout *coughKiper* cough. What these writers and fans fail to realize is the brilliance of Panthers GM David Gettleman. He restructured all the over-the-top contracts that Marty Hurney had left him with, Gettleman improved the team with key additions after coming into the position way over the cap. He added Domenik Hixon (WR NY GIants) and Tedd Ginn Jr (WR 49ers), amongst others. While the writers, along with the fan base were skeptical to say the least to see two unproven and unpolished wideouts come in instead of using one of our high picks to bring in a new, fresh-faced receiver to fall in love with before turning on him six weeks in. Other than a LaFell drop on a fourth down against Arizona and a purrrfectly placed bomb that went through Ginns' hands; these guys are studs in their own right. Not to mention tight end Greg Olsen, who currently leads the team in receptions. Do you know who leads the team in yards and is at Olsen's heals for most receptions? Tedd Ginn Jr. The scrub no one wanted, the stone hands, the "waste of a pick". Ginn flows perfectly into Offensive Coordinator Mike Shula's scheme. 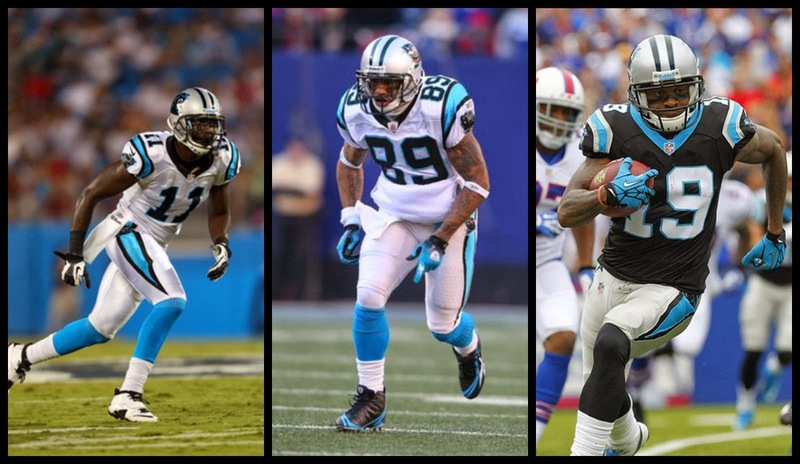 One thing I can't place about these guys (LaFell in particular) is it seems they are afraid of taking a hit. Ginn seems to be okay with this, but, if you watch LaFell closely on plays where he gets the ball you'll notice he makes a B-line towards the out-of-bounds chalk rather than push it downfield for more yards, or maybe even six points. Something had him frightened. Never the less, he is a solid number two option as his route running (along with Ginn's) have improved drastically. Speaking of catching the ball, here is an interesting stat; over the past four games Cam Newton's average pass is around six yards. During that time he has yet to turn the ball over and is completing 77% of his passes. This is vastly different than his 12-yard average attempt at the beginning of the season while garnering nowhere near a respectable completion percentage. Which leads me to the other under the radar receivers; the checkdown guys. So far it has been running back Deangelo Willliams and half man/ half bowling ball Mike Tolbert. What helps the checkdown out is the traditional receivers clearing the middle of the field to let our backs get into the flat which, in turn, helps us sustain long drives that has us second in the league in time of possession. Now to the legend, Steve Smith. Numbers wise it seems he isn't as active as last year. 89 is drawing the attention of the opposing teams top defensive backs. For example, in man-to-man Smith draws the opposing teams' best corner and at least a pair of eyes from a safety. In zone coverage it appears the defenders are more concerned with passing Smith from zone to zone and they neglect the small pockets where Ginn and/or LaFell can sit and pick up an easy fifteen yards. However, a lot of times this coverage has proven insignificant and Smith rips their coverage scheme to shreads. See Rams corner, Janoris Jenkins. The bottom line is that if you only game plan for Cam, the backfield, and Smith - You're going to be down two touchdowns at halftime. Look both ways before crossing the street, the Panthers are on the prowl.